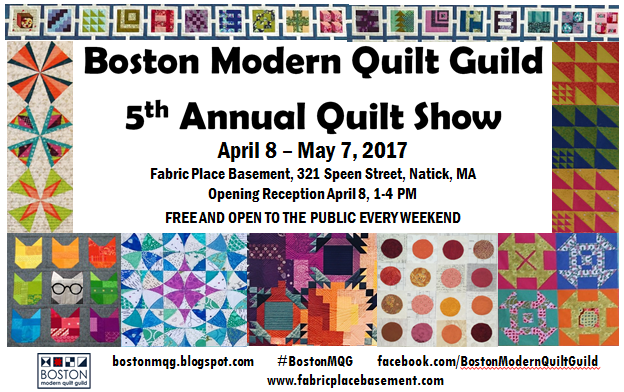 The Boston Modern Quilt Guild's Annual Show is opening on April 8 and will run every weekend through May 7, with the exception of Easter Sunday. It will be held at Fabric Place Basement in Natick MA. Please join their guild for a reception on April 8 or on any weekend. The BMQG is also raffling off a beautiful quilt this year - the modern churn dash that was displayed at last year's show. If your guild would like to make a road trip during the week, please let Karen Leavitt know (kkleaveit@yahoo.com) and she can arrange to meet you there and give you a private showing.